When most people think about extreme sports, activities like bungee jumping and rock climbing are usually on the list. But according to Georgia State student Matt Hiltman, a senior and philosophy major, there is one sport that tops most people’s idea of extreme. The name of this extreme sport is jousting. It’s an unfamiliar sport to many people in the Southern region, but Hiltman is an exception, and a highly-experienced one at that. 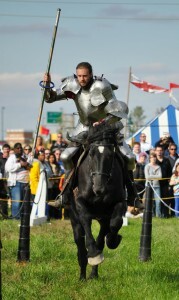 Jousting is Matt Hiltman’s favorite hobby and once worked at Medieval Times for five years doing the competitive sport. According to history.com, jousting can be traced back centuries ago to the medieval era in which men from all levels of the social ladder were extensively and often dangerously taught how to defend their king should a war erupt. Considered by most historians to be the first-known extreme sport, it slowly dwindled into a form of entertainment until its popularity shrunk as safer forms of extreme sports took its place. Although its popularity in modern times is nothing compared to its first few decades of existence, jousters like Hiltman view it as competitively as other athletes view more popular sports like basketball. Hiltman is so competitive in jousting, he auditioned for History Channel’s Full Metal Jousting earlier this year and became one of 16 contestants. He made it to the final two before losing to contestant Joshua Knowels. After the end of the show’s first season, Hiltman and other contestants are occasionally invited by host Shane Adams, who has his own full-time jouster troop, to participate in renaissance festivals where the demand for jousters is most high. Despite the casual manner in which Hiltman explains his love for jousting, the details of how it unfolds between two competitors may seem too intense for even the most skilled athlete. This is a contact sport with blows that feel like a car crash, according to jouster Matt Hiltman. 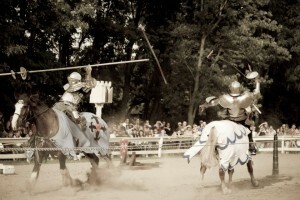 Although the men have on armor, Hiltman explains that the goal of this particular German-style of jousting used in the show is to strike the opponent in what’s called a gridded guard grand. This plate can be found underneath the jouster’s armor to catch the opponent’s lance. According to Hiltman, competitors don’t receive any points unless they superficially strike the opponent’s gridded grand guard. Whether he’s competing or doing it for entertainment purposes, Hiltman enjoys the adrenaline rush. Even Hiltman’s family and friends support and encourage his favorite sport. Growing up, Hiltman said he’s always been somewhat of a risk-taker. He was a boy scout and in his later years as a young adult, he enjoyed scuba-diving and power gliding. After graduating high school, Hiltman landed a job at Atlanta’s Medieval Times, a dinner attraction with a theme centered on that specific era. Jousting is used as a form of entertainment for customers. Midway through his almost five-year position at Medieval Times, Hiltman enrolled at Georgia State University and eventually quit his job. 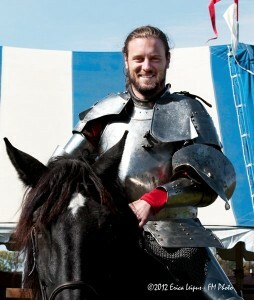 Six months after quitting, he heard about a casting call for the show “Full Metal Jousting,” and the rest is history. As risky as the sport sounds, Hiltman doesn’t fear anything, including his own safety. He said he’s never had any broken bones, stitches, nasty scars or anything else at this point in his jousting experience, although he did receive a minor leg injury during the taping of “Full Metal Jousting.” Even still, he insists that other sports cause more harm than jousting.